I was poking around CodeAcademy this afternoon, trying to decide if I want to use the HTML/CSS modules with my classes. HTML actually lets us have more than one heading size. Without CSS, the browser determines the type style and size that is associated with the headings. It’s true that the early browsers sucketh seriously: the programmer-determined sizes/weights bore no relationship to information hierarchy. So even though it was wrong, I understood why, in the mid-90s, visual designers jumbled the headings in order to create visual order. But today? With CSS easily handy to impose a visual hierarchy that matches the rank hierarchy? Do not do this. The proper set is h1, h2 and h3. It’s possible – but unlikely – that this is the only such error. When I started teaching HTML in the mid-90s, I had to correct errors like this in what were v1 HTML textbooks. In fact, I quit teaching in one program because admin insisted that we all use the same textbook, which was riddled with coding errors. Intellectually, I understood the policy: keep a semblance of uniformity across classes taught by adjuncts. But emotionally? I couldn’t use the textbook. And it took too much (unpaid) time to develop a set of fixes for every example. Which no other instructor would have been using. 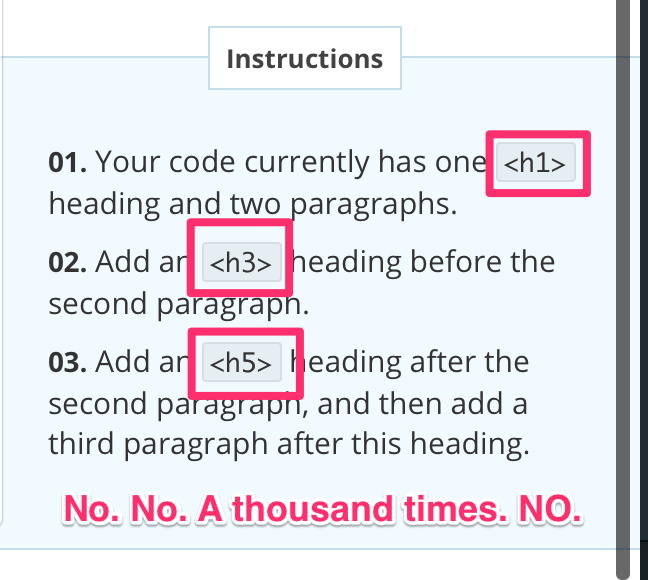 With this one very basic error, CodeAcademy has squashed any enthusiasm I might have had for using it as a resource. I’d like to learn PHP and was thinking about using CodeAcademy to get a jumpstart. But now … I wonder what errors I’d learn along the way that I’d have to unlearn later. Conceptually, I think CodeAcademy is the bee’s knees. I love the idea of universal code literacy. But to think that there are thousands – maybe millions – of people around the globe getting their basic start with HTML without a fundamental introduction to structured information … it makes me want to cry.